Happy Halloween! This week's Muster describes the wide variety of activities that we were involved in last week including fundraising for Chrissy Houlahan, a progressive candidate challenging a conservative GOP incumbent in Pennsylvania; collecting signatures for a ballot initiative to overturn Citizens United; being a part of First Parish's Voices on the Green "I Protest" event; and learning about a citizens' article to request an impeachment investigation of Donald Trump that will be voted on at Weston's Special Town Meeting in November. The next few weeks will be equally busy with team meetings, the second Massachusetts Indivisible Conference (which is spotlighted below), two Lobby Days at the State House, actions to oppose the tax proposals, and keeping up with developments in the Mueller investigation. While our work is serious, we strongly believe it's important to take the time to get to know each other and have a little fun. 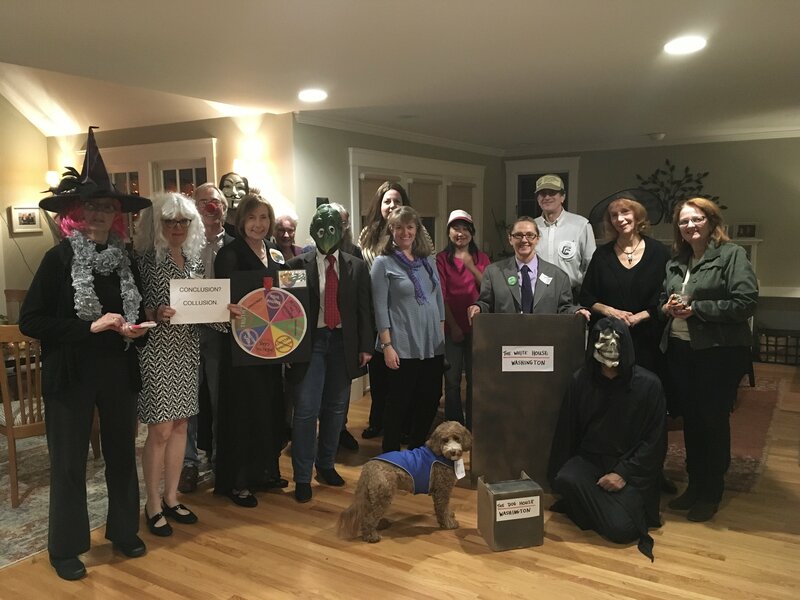 In that spirit, for this Halloween edition of the Muster we'd like to share this photo from a local Halloween party with a political theme and some familiar faces. We're grateful for all your efforts and support and look forward to working with you in November! 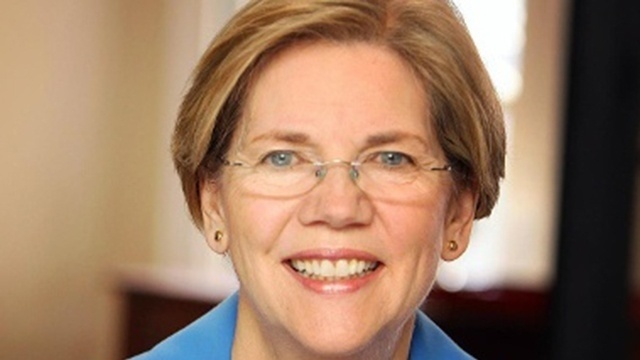 and just confirmed...Senator Warren will be the keynote speaker! 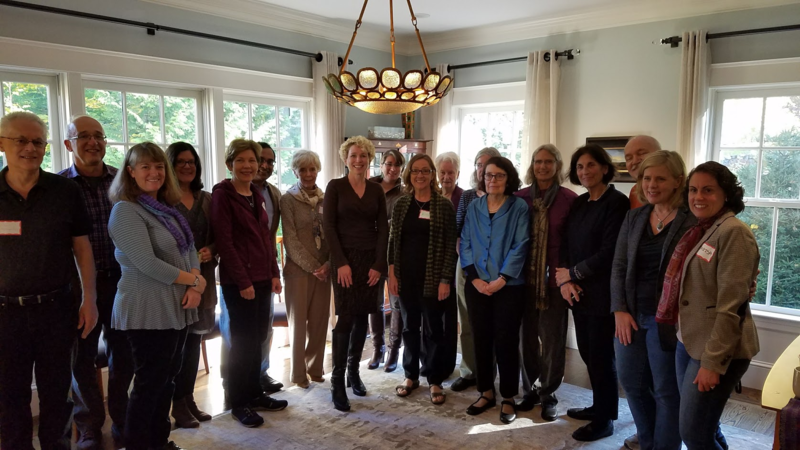 Senator Warren will kick off our Massachusetts Indivisible conference with "The Way Forward," when we gather on Sunday, November 12th in Worcester. And she's just the first of a whole slate of truly inspiring and informative speakers to help you up your activism game. It will have been one year since the election, and we'll spend the day learning, connecting, and readying ourselves for the all-important 2018 season. There are 22 different workshops on offer! Issues based workshops, Climate Change, Healthcare, Racial Justice and Education Reform to name a few, plus many "skills" workshops - everything from how to lobby the statehouse and using social media effectively, to group leadership and retention and one-on-one conversation training. Plus there will be two sessions on developing your 2018 electoral plan: from candidate selection to tactics and timing, learning best practices from those who've been honing these skills for years. The suggested ticket price is $20 for the day. Carpools will be running from Lexington and other neighboring communities. Mueller Rapid Response - Be Prepared! Indictments from the Mueller investigation against Trump campaign chairman Paul Manafort and former Trump campaign official Rick Gates were unsealed on Monday. The Constitutional Democracy team's RussiaGate group encourages everybody to sign up for the "Rapid Response" being planned if Mueller is fired - be ready to take to the streets if this constitutional crisis happens. The #MarchForTruth has partnered with MoveOn.org, Public Citizen, Indivisible, and many others to prepare emergency "Nobody is Above the Law" rallies that will happen directly following the firing should it occur. Go here for more information and to sign up. Indivisible also has a call script for asking your MoC to prevent Trump from firing Mueller here. The TrumpTaxScam bill is scheduled to be released on Nov.1st and the GOP is hoping to rush the bill through Congress with a vote in the House before Thanksgiving and Senate passage soon after. Indivisible and other organizations are planning a national call in day on Thursday, Nov. 2nd. Our MoCs have been vocal in their opposition to the TrumpTaxScam. They need to know that we appreciate and support their efforts, so please mark your calendars and keep the phones at the Capitol ringing off the hook this Thursday. Help your neighbors, and counter Trump’s attempted sabotage of the ACA, by marketing enrollment to millions of Americans aided by the healthcare law. 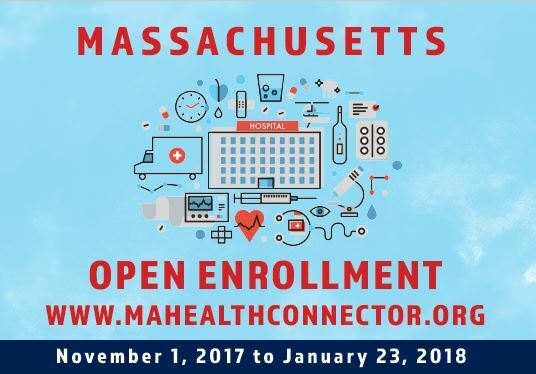 Open enrollment for next year begins on Nov. 1; in Massachusetts, the enrollment period ends on January 23rd, but in many states it runs only until Dec. 15th. Indivisible has fact sheets, scripts, and flyers here. You can share information about the open enrollment period on social media or download a MA-specific flyer (or one for any other state) to distribute in your neighborhood or send to your friends or family in other states. This is NOT about campaigning against Trump, but about helping your neighbors regardless of their political persuasions! Help Free Rosa Maria! What Would You Want if She was Your Child? 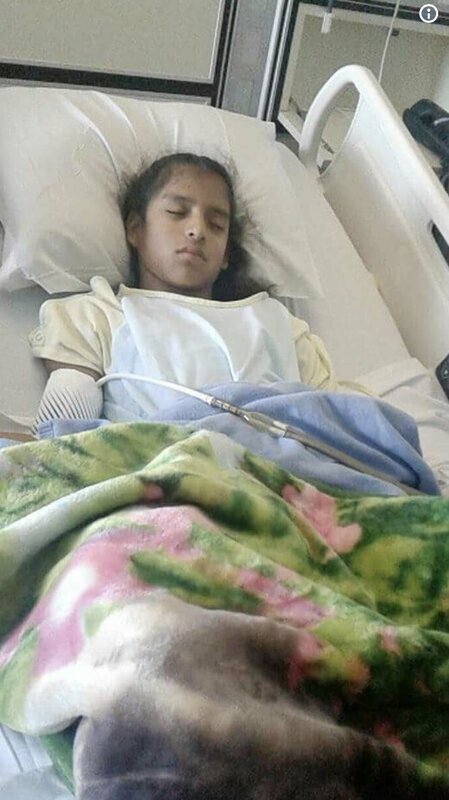 Border patrol agents followed the ambulance and camped outside the hospital room of a 10-year-old girl with cerebral palsy getting emergency surgery – then sent her to a detention center for kids rather than releasing her to the custody of relatives who are legal US residents. Rosa Maria is undocumented and was brought to the United States from Mexico when she was 3 months old. She was diagnosed with cerebral palsy and has the mental capacity of a child half her age, according to her mother, who said her daughter doesn't understand what's happening. 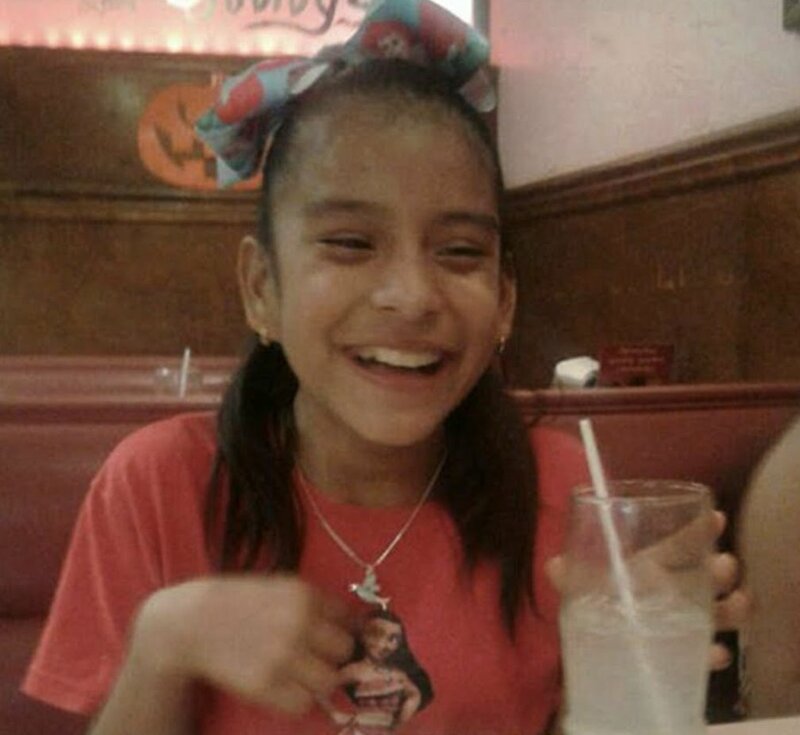 Join legislators and others who are speaking out: sign this petition or use this link to call the Office of Refugee Resettlement today and demand they release Rosa Maria Hernandez immediately. A key part of the Trump administration’s surveillance authority is set to expire at the end of 2017, unless Congress reauthorizes it. Every MOC is going to have to decide whether to protect Americans’ privacy or to leave this authority in Trump’s hands. The law that’s expiring on December 31, 2017 is Section 702 of the FISA Amendments Act of 2008. This is a post-9/11 program that Congress passed; it allowed broad warrantless spying authority. Call your MOC and tell them: don’t let Trump spy on us - either close the “backdoor search” loophole or let Section 702 expire. More information and call scripts here. Last week a couple of members went to a discussion on "The Constitution and Donald Trump." 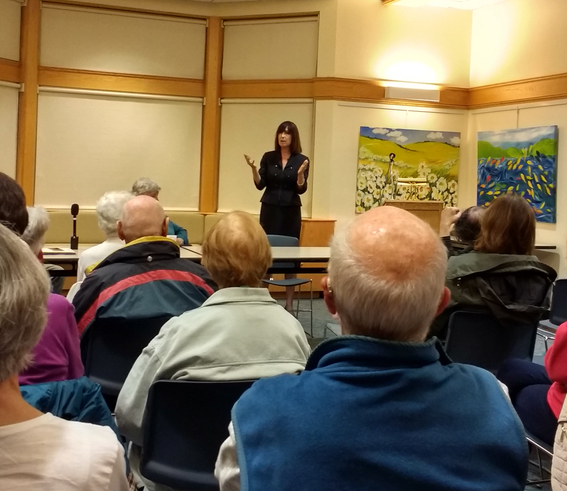 The League of Women Votes of Weston hosted the event in preparation for a Special Town Meeting in November when Weston voters will consider a citizen's petition calling on the U.S. House of Representatives to launch an impeachment investigation of Donald Trump to determine whether the president is violating the Emoluments Clause of the Constitution. 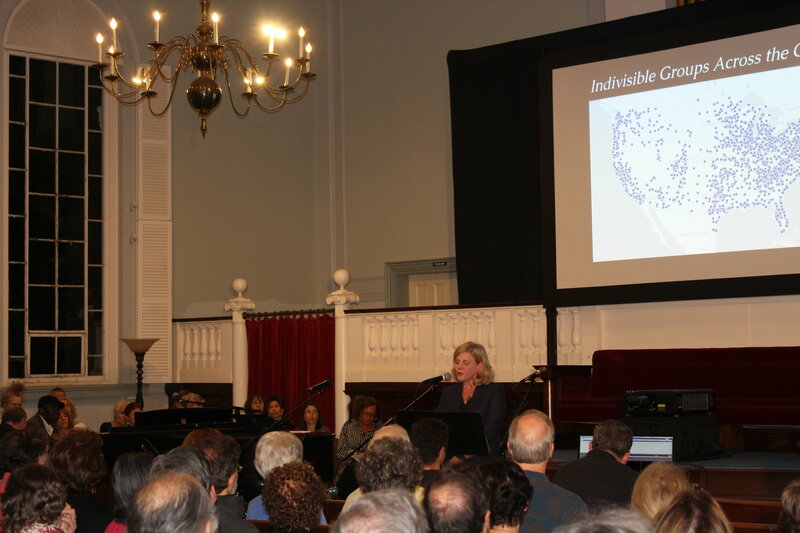 The program featured Marguerite M. Dorn, an attorney, law professor, and consultant, who is currently a Board member of Free Speech for People, a national nonprofit that “works to renew our democracy and our U.S. Constitution.” She spoke about the impeachment process, potential grounds for impeachment, and the importance of giving local citizens a voice on the national scene. 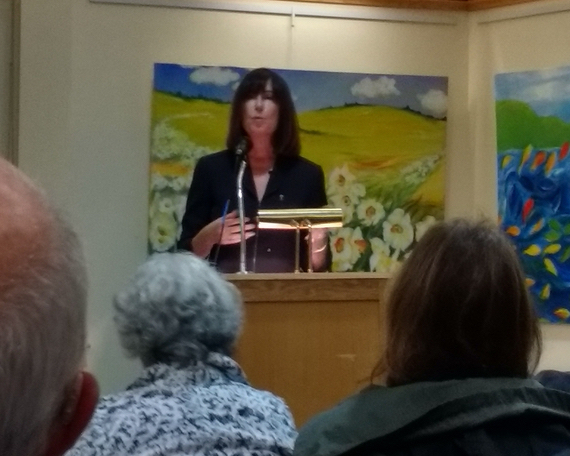 The program was excellent and was recorded by Weston's Public Media Center. As soon as the video is available online, we'll let you know. In the course of the presentation, Marguerite mentioned that she is seeing three types of political action: policy, elections, and pressure. 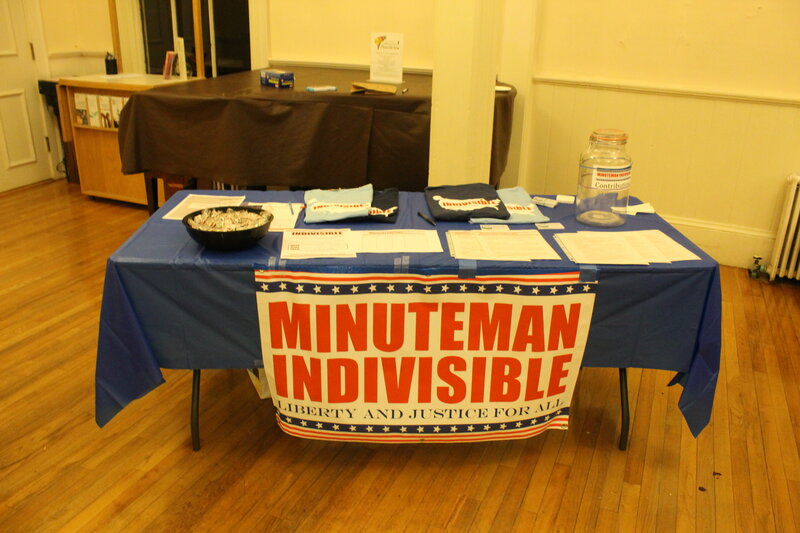 Minuteman Indivisible offers all three of these types of action. For example, our Healthcare Team is advocating for Medicare for All, the Elections Team is focused on flipping the House in 2018, and the Democracy Team is keeping pressure on the RussiaGate investigation. Depending on your interests, one type of action might appeal more than another. The main thing is to find the issue/action that works for you and just keep doing it - we have a place for everybody. The MI Elections Team fundraiser Breakfast with Chrissy, held last Friday raised over $3600 for the PA06 Congressional candidate. Indivisibles from several local groups heard Chrissy Houlahan speak about why she decided to run for Congress, why she thinks this seat can be flipped, and what issues she is most passionate about including affordable health care, public education, jobs, women's health, and the environment. The congressional race in the PA06 district is being named the bellwether race of 2018. Chrissy is one of the Elections Team's selected candidates. She's endorsed by Emily's List, and the DCCC, as well as by Rep. Seth Moulton. To learn more about Chrissy's campaign and why we are supporting her, see our writeup on our webpage. Thank you for your contributions and for attending the event. We’d love to close out this event at the $4,000 mark. Please help us achieve this goal by contributing here. On Saturday October 28, First Parish Church presented a program entitled “I Protest,” as part of its Voices on the Green series. Our own Michelle Olson spoke about the founding of Minuteman Indivisible along with other Lexington residents who discussed the 1971 protest against the Viet Nam War on the Lexington Green and the writing of the protest song “Charlie and the MTA.” We staffed a table with information about Minuteman Indivisible, where we also signed up new members and sold some of our new T-shirts. It was exciting for our organization to be viewed as part of Lexington's proud history of protest and we appreciated the encouragement and support we received from existing members and new ones alike. Signature Gathering to Overturn Citizens United! Our Weekday Warriors team is helping People Govern, Not Money (PGNM) gather signatures for a ballot initiative to help overturn Citizens United and get big money out of politics. This is a short, intense campaign that requires all hands on deck as PGNM needs to collect 90,000 signatures by Nov 22. We have collected signatures at Lexington's Special Town Meeting, the Farmers Market, and at local grocery stores. Jump in and help us in this historic effort. Check PGNM's home page for an updated schedule of where they plan to collect signatures and sign up to help using this link. The Environmental League of Massachusetts is organizing a Parks and Water Lobby Day. Meet with state legislators to seek better funding for the agencies that oversee state parks and waterways. If you're interested in participating (or just want to learn more about the issue), see this link. Join us for the next Healthcare meeting! We will be talking about marketing ACA enrollment and the ongoing threats to funding for Medicaid, Medicare, and the ACA subsidies. One Book, One Bedford is hosting several speakers as part of their focus on the MARCH trilogy, an acclaimed set of graphic novels about the life of Representative John Lewis. On Saturday, Nov. 4, the Reverend Irene Monroe will discuss how to bring the issues and events of MARCH into the present day. On Sunday, Nov. 5th, Civil Rights activist and former Student Non-Violent Coordinating Committee (SNCC) Field Secretary Robert Pariss Moses, will be interviewed about his experiences in the Civil Rights movement, some of which are covered in MARCH, Book Three. Come to a Meet and Greet in Concord with Newton Mayor Setti Warren and bring a friend. Setti Warren is a Democrat running for Governor because it’s time for a new generation of leaders to tackle economic inequality in the Commonwealth of Massachusetts. RSVP here. Lexington Community Center, Room TBD. 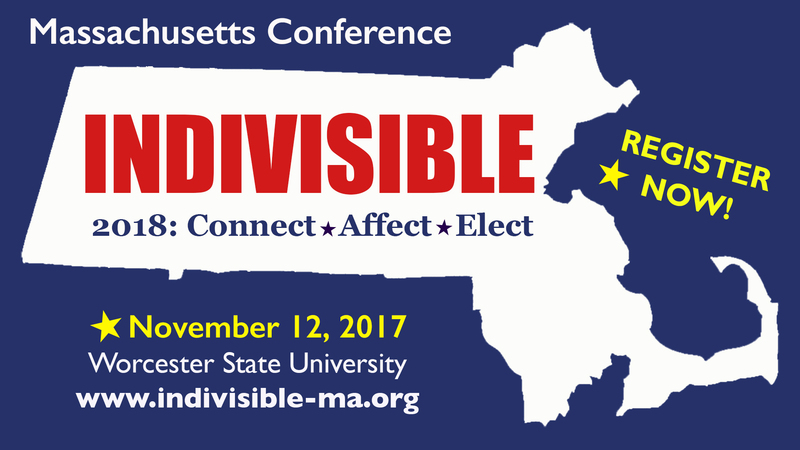 Register now for this conference for Indivisible members across the state of Massachusetts. This will be a full day event with specialized skills development workshops as well as networking opportunities. There will be a special focus on preparing for the 2018 election cycle, just around the corner. The goal is to make us all more connected and effective in our activism. Check the Conference Website, Facebook page, or Twitter feed for the latest updates. Can’t make it to the conference, but want to help support our efforts? You can donate using this GoFundMe page. Join hundreds of single-payer supporters from across Massachusetts at the State House for the Right to Health MA Lobby Day, a day of education, demonstration, and legislative advocacy. The day will include informative sessions on the concept of single-payer healthcare, as well as specifics on current legislation. 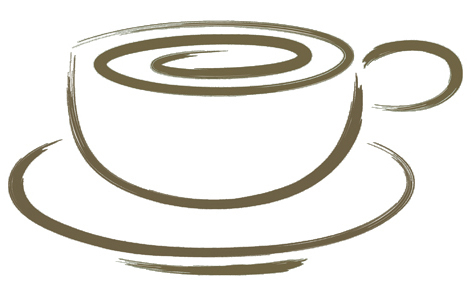 Attendees will also have a chance to meet with their elected officials one-on-one or in small groups. This phrase, "thinking past the sale," has been coming up a lot lately. What is that all about? It's a way to say things that "assume the sale" - a psychological strategy designed to impact your decision making or thinking. So, when we read headlines like "First Charges Filed in Mueller Investigation," we are led to believe that there will be more. Can't wait!